When you need to get outdoors and make the most of your time off, head to Forest Grove for easy access adventures that will have you feeling miles away from the crowds. 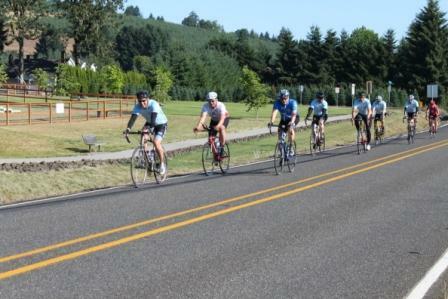 Less than 45 minutes from downtown Portland, you’ll be amazed by the variety of recreation options in Forest Grove’s backyard. Adrenaline junkies can master the ropes at an adventure park, while those who prefer to keep two feet on the ground can hike the trails at the local wetlands and parks, keeping their eyes peeled for elusive wildlife and breathtaking wildflowers. On- and off-road biking options are many, or you can rent a boat and paddle your way around Hagg Lake, with or without your fishing gear in tow. Enjoy a round of golf at one of the outstanding golf courses in the area or if you fancy being outdoors with a pint in hand, grab a beverage and play a round of disc golf at McMenamins Grand Lodge. You can keep your visit strictly outdoors by pitching your tent at one of our local camping areas, or if you prefer a little pampering when you get away, try one of our lodging options. After a day of blissful outdoor escape, relax in our historic downtown where you can grab a bite to eat, sip a glass of wine and shop for a memento to remember your Forest Grove escape.